Hooters Restaurants have been dedicated to updating their brand by rolling out beautiful and stunning renovations to their existing and new construction locations throughout the United States. 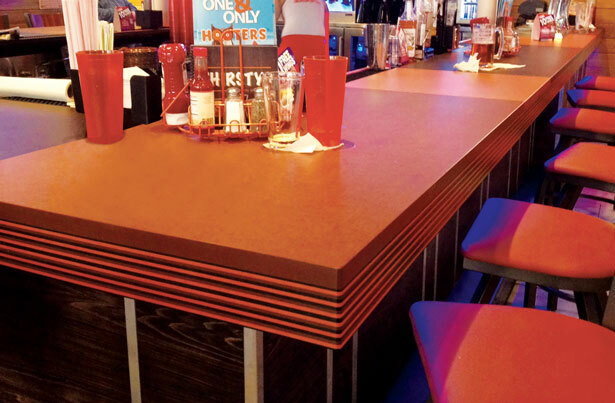 The central focus of their renovation can be found in many items, but the number one item can be found with their new bar tops that are made out Richlite paper composite surfaces. Alterna is proud to be the supply partner for all Hooters locations that have incorporated the new Richlite bar in the United States and Canada. The Dome Restaurant, Bar and Lounge in Coral Gables recently opened its doors to the public with an impressive LEED™ Silver Certification. 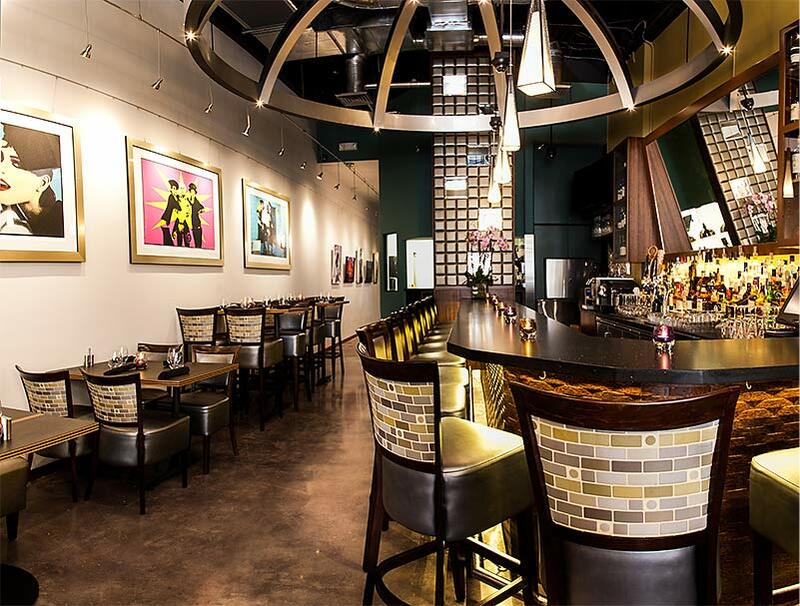 With the help of Alterna, this Latin American Fusion and Caviar Bar is doing its part to conserve natural resources by utilizing Richlite’s paper composite surfaces Cascade Collection for all of the table tops in the restaurant. In addition, the signature dome structure that is suspended from the ceiling is also fabricated out of Richlite, thereby illustrating that conservation can be achieved without compromising design. According to Alterna Vice President Mark Gunia, “The Richlite table tops will outperform other traditional table top materials for the restaurant and hospitality industry because the material is extremely dense, impervious to water and may be renewed endlessly to look like new. Plus, indoor air quality will not be compromised since Richlite is GreenGuard certified and will not emit formaldehyde.” Smith and Fong’s Durapalm Coconut Palm Woven and Tambour Paneling was used as well to accent the bar and enhance the aesthetics of this sophisticated space. The Dome has been featured in a number of design and food publications and also has received tremendous recognition, such as the prestigious Green Pineapple award from the Coral Gables Chamber of Commerce. For more information about this project, please visit their site. With the interior design work from Glenda Simon and Enith Lam from GHRS and the green building products from Alterna, this Latin American Fusion and Caviar Bar is doing its part to conserve natural resources by utilizing Richlite's paper composite surfaces Cascade Collection for all of the table tops in the restaurant. Carlisle Development Group, one of the nation’s leading providers of quality affordable housing, has gone green with the help of Alterna. Alterna is supplying all of the high efficiency plumbing fixtures for the Tallman Pines project located at 700 NE 41st Street in Deerfield Beach, Florida. Tallman Pines, a 200 unit project, features Caroma Dual Flush Toilets and ecoTap high efficiency faucets and shower systems, which will save the project thousands of gallons of water per month. According to Alterna President Nick Gunia, "The plumbing fixtures in Tallman Pines are likely the most efficient in the entire State of Florida for a multifamily project." Alterna Corp. Supplies High Efficiency Plumbing Fixtures for first Green STAPLES® store. Staples® (Nasdaq: SPLS), the world's largest office products company is going green with the help of Alterna Corp. Alterna is supplying all of the high efficiency plumbing fixtures for the project, which include Caroma's Dual Flush Toilets, Sustainable Solutions' ecoTap line of high efficiency bathroom and kitchen faucets and shower systems and Waterless Co.'s no flush urinals. The new store will be the first green Staples in the world, not to mention Miami's first green retail building registered under the U.S . Green Building Council's LEEDTM framework. Alterna Corp. President Nick Gunia attended the groundbreaking ceremony that took place at 2121 Biscayne Boulevard, where Mayor Manny Diaz and Staples Regional Vice President Royce Reed celebrated the City's progress in sustaining its future through eco-friendly practices.